“The NFP number will be seen as positive for the US markets, despite the fact that it means that we are a further step closer to the rate hike,” said a market analyst at GFX. 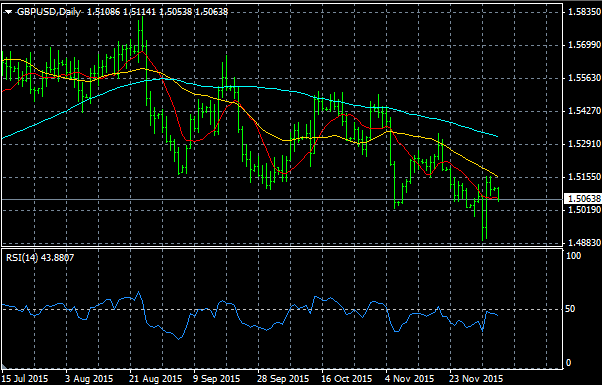 The technical analysis for GBPUSD adds more weight to this direction, with the 10 and 309 moving averages still way down below the 100 day moving average, with relative strength index trending down below 50. For now, most gains are likely to sell off until there is a shift in sentiment. The big focus last week was on the interest rate from the ECB, which remained unchanged at 0.05%. This prompted a sharp gain in Euro against most other currency however a mixed bag of other data has many traders holding back for more clarity. Many will have eyes on Friday’s release of Targeted LTRO, which will show data on the total value of money the ECB will create and use to loan to Eurozone banks. From a technical analysis view point, the 10 and 30 day moving averages still remain below the 100 day average, despite the sharp rise last week. However, the relative strength index bumped up above 50 for the first time since middle of October. If the strength can stay in the price and sentiment begins to shift, it’s possible an assault on the 1.0100 area could be on the cards, as price looks to retest the old support which may become resistance. This should become clearer if price is bought up again before it retraces fully beyond the lows of the sharp spike up after last week’s ECB interest rate decision.